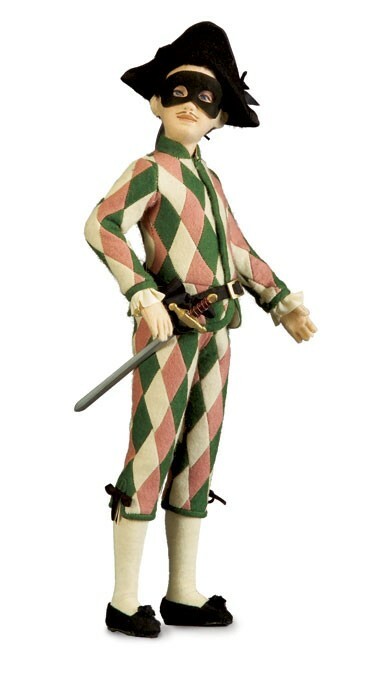 R. John Wright - "Harlequin" - LE250 - Souvenir from 2006 MDCC (Modern Doll Club Convention). One of three dolls created for the The Commedia del'arte Collection. "Harlequin" features an all-felt, 17" tall, fully jointed doll with molded and hand painted facial features and high quality raven, mohair wig. He's wearing a pieced felt jacket with cream colored ruffled cuffs and pants with metal buckled belt; white stockings; black shoes, hat and mask. He comes with a custom-made sword secured in a special loop on his belt. NRFB. He comes inside a deluxe presentation box (and slip-cover) with a numbered certificate of authenticity (LE 0184/250).